Nokia 8.1 smartphone expected to launch at 10th December 2018 in India. 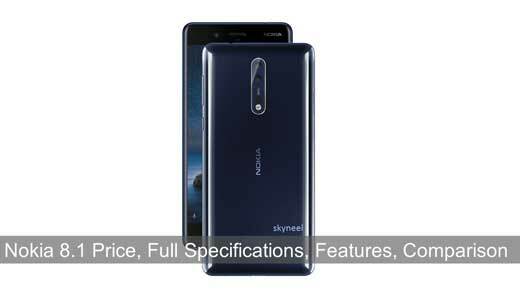 It is an upcoming hybrid dual sim smartphone which is launched by Nokia. Nokia 8.1 is powered by octa-core processor and comes with 4GB of RAM with 64GB of internal storage. You can expanded storage space up to 400GB via a microSD card. Nokia 8.1 smartphone price in India could be above the Rs. 20,000 while Nokia 7.1 has been launched in India at Rs. 19,999. Nokia 8.1 will be a re-branded global version of the Nokia X7. If we talk about the camera, this smartphone comes with 12-megapixel rear camera. This smartphone comes with 1/2.55″ Sony IMX363 sensor, f/1.8 aperture, dual-tone LED flash, 1.4μm pixels, OIS. The Nokia 8.1 dual sim GSM and GSM smartphone. Connectivity options include Wi-Fi, GPS, Bluetooth, USB Type-C, FM, 3G and 4G. You can also get Face unlock, Fingerprint, Compass, Magnetometer, Accelerator, Ambient light sensor with Gyroscope feature. This smartphone supports Volte/4G/3G/2G on compatible networks. This smartphone is available in different four colors like Dark Blue, Night Red, Night Black, and Magic Night Silver. Processor Qualcomm Octa Core Snapdragon 710 10nm SoC paired with Adreno 616 GPU, Android 9.0 (Pie) O.S., GPU Adreno 616. Memory Available in two variants 64+128 GB, 4+6 GB RAM internal storage memory. Expandable up to 400GB via microSD. Display 6.18″ IPS LCD capacitive touchscreen, 16M colors. 1080 x 2246 resolution, Corning Gorilla Glass 3 with Android 9.0 Pie, Android One. Dimensions Height:154.5 mm, Width: 75.76 mm, Thickness: 7.97 mm, Weight: 178 g.
Camera Camera, this smartphone comes with 12-megapixel rear camera with 1/2.55″ Sony IMX363 sensor, f/1.8 aperture, dual-tone LED flash, 1.4μm pixels, OIS. Battery 3500mAh with fast charging. Price & Color Priced above Rs.20,000. Color: Dark Blue, Night Red, Night Black, and Magic Night Silver. All Nokia phone lovers, please wait for this smartphone. Till date wait for Nokia 8.1 smartphone. Thanks.